Are these myths keeping you from getting a flu shot? According to the director of the Centers for Disease Control and Prevention (CDC), the 2014-15 flu season may be worse than average. If you haven’t gotten a flu shot yet, there’s still time to get vaccinated. And that recommendation is valid even acknowledging that this year’s vaccine is not as effective as past years’ vaccines. Some people avoid getting immunized because they believe the common myths about the flu vaccine. Understanding the evidence-based reality about the flu vaccine is important. 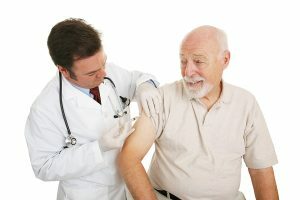 By getting immunized, you lower your risk of being infected with the flu and of developing the sometimes serious complications it can cause, which is especially important for higher risk groups such as young children, the elderly, pregnant women and people with chronic health conditions like diabetes, asthma and heart disease. The most common myth about the flu vaccine is that it can actually infect you with the flu. In fact, the virus contained in the flu shot is inactivated (dead), so it cannot infect you. Some of the side effects that people experience after the shot—headache, low-grade fever, mild achiness—may incorrectly lead them to believe the shot has given them the flu, but that is not the case. The nasal mist vaccine does contain live virus, but that virus has been attenuated, or weakened, and it cannot cause a case of flu. The weakened virus has been modified so that it dies once it travels from the cooler tissue in your nose to warmer areas of the body like the lungs. However, the nasal mist vaccine is not recommended for certain age groups and for those whose immunity is compromised by other conditions. Myth #2: The flu shot doesn’t work well, so it’s not worth getting. The manufacturers of flu vaccines have to project which strains of flu are likely to occur in a given year and include those strains in the vaccine. Some years, their projections are more accurate than others, which means the effectiveness of the vaccine could be greater or lesser, but that does not mean it’s not worth immunizing yourself and your loved ones. Even though a mutant strain has reduced the effectiveness this year, the vaccine is highly effective in preventing the other flu strains that are circulating. Myth #3: I’ve had the flu, so I’m immune. Each year, the strains of flu that circulate can be different, so even if you had the flu last year or even earlier this year, you are still vulnerable to the other strains. Some people ask why vaccination for the flu isn’t like vaccination against measles or chickenpox, where the immunity lasts for years. Again, it is because the strains of flu can be different each flu season, so the previous year’s vaccine may not have included a strain that’s prevalent this year. There are two types of flu vaccine available, trivalent (protects against three strains of flu) and quadrivalent (protects against four strains). The trivalent vaccine protects against two strains of influenza A and one type of influenza B. Each flu season, however, there is usually more than one strain of influenza B in circulation. To provide broader protection, the quadrivalent vaccine, which protects against two A strains and two B strains, was introduced in 2013. The trivalent vaccine in only available as an injection and is considered safe and effective for children ages 6 months and up and adults. There is also a high dose version of the trivalent vaccine approved for use by people 65 and older. The quadrivalent vaccine is available as both an injection and a nasal mist. The mist is approved for use by adults up to age 49 and children age 2 and up. There are some people who should not get the mist vaccine, including pregnant women, people over 50, and people with heart, lung or kidney disease, and diabetics. Getting vaccinated against the flu is part of a wise preventive healthcare strategy. To decide which vaccine is most appropriate for your personal health situation, you should talk with your doctor. To learn more about how you can build a comprehensive strategy to protect your health, talk to a personal health advisor.